We have a seat saved for your child! 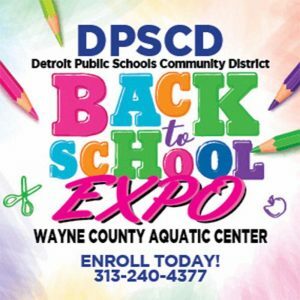 Join us on Saturday, August 26 from 11 a.m. – 3 p.m. for a fun-filled, free Back-to-School Expo at the Wayne County Family Aquatic Center located at 12600 Chandler Park Dr. Detroit, MI 48213. Families will receive free admission to the Aquatic Center with event participation! Learn about DPSCD schools, their exciting programs and unique opportunities. Make sure to visit our “STEAMy DPSCD” booth for school information, and to pre-enroll your child in a DPSCD school. There will be giveaways to families who pre-enroll and to DPSCD parents who bring a non-DPSCD parent to the event to pre-enroll. You’ll also have a chance to chat with the new Superintendent and Board members, receive complimentary health screenings and get a free haircut to look your best on the first day of school! We’re seeking students to showcase their talent during the expo! If you are a student with a special talent, sign up here. Visit detroitk12.org/enroll for more information on how to enroll your child today.